For those of you who don’t know what I am talking about (but have persevered read this far, having realised that this is a post about cricket) it was the first ball delivered by Australia’s Shane Warne in his first Ashes Test in England. England had won the toss and put the tourists into bat… they amassed a modest 289, before it was our turn to have a waft of the willow. 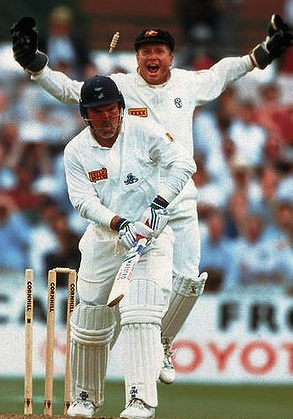 Atherton scored 71 before falling to Merv Hughes’s moustache, heralding the arrival of Mike Gatting to the crease. Gatting was never a ‘lightweight player,’ and was regarded as one of the finest players of spin in the world. He probably still is for that matter… but the delivery he received first ball was quite simply the best ball ever bowled in Test Match cricket. You can see it here. The ball became a source of myth, and also prompted some of the best loved cricketing commentary. The England captain at the time Graham Gooch added, “If it had been a cheese roll, it would never have got past him.” Harsh, but fair.